What is PIG? – This is a pathology based finding seen rarely in the EM section of the report. It is a form of glomerulopathy, in which microspheres or microtubular structure or both are associated with infolding of cytoplasmic processes of podocytes into the glomerular basement membrane. This type of glomerulopathy is not included in the World Health Organization’s classification of glomerular diseases but has been noticed in few cases reports and large case series from Japan. Associations: In the largest series from Japan, most patients might have a subtype of lupus, nephritis class V, or membranous glomerulonephritis. MCTD, Sjogren's syndrome and tumor lysis syndrome was also found. Interestingly, hydronephrosis was associated with most patients seen with this entity. There have been cases associated with Myeloma as well. Electron micrograph shows cytoplasmic processes of podocytes infolded into the GBM. At the end of an infolded cytoplasmic process of podocyte, microspheres or microtubular structures or both were found. b The infolded cytoplasmic process of a podocyte went through the middle layer of the GBM, which was accompanied by thickening of the lamina densa. The pathogenic mechanism of PIG is unknown. Hydronephrosis was found in three of 25 patients. However, no study has shown that experimental hydronephrosis can induce podocytic infolding.In the large series from Japan, all had GBM thickening, and IF was negative in many, followed by some that had only C1q,c3 and some with a full house pattern. 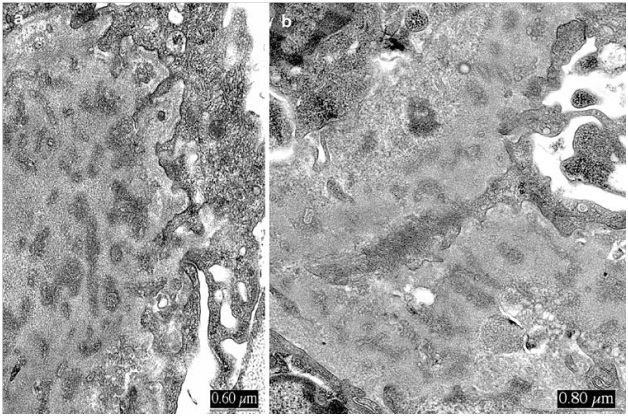 Membranous GN is the most common light microscopy finding followed by FSGS and MPGN. In an earlier report, some might have called this entity Membranous glomerulopathy with spherules. 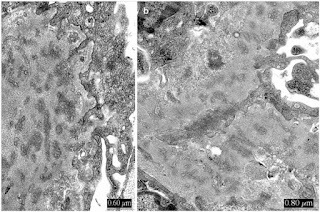 Some researchers performed an immunohistochemical study of complement C5b-9 complexes in several human kidney diseases and have shown positive reactions on round extracellular particles and on striated membranous structures in the GBM. Therefore, the mechanism of podocytic infolding might be related to the role of special types of complement activation in situ on the microstructure. We don’t know if infolding of the podocyte cytoplasm may be a pattern of GBM/podocyte disruption rather than a true disease entity. However, the diffuse extent and severity of PIG raise the suspicion of defects in the repair mechanism. Worth a read as we learn about this new entity!